Here we are in the Mt. Prospect police Station Booking Room. Officer Roscop is explaining to us about how fingerprints are taken differently nowadays. While he is doing so, he is fingerprinting Yuri's boy the old fashioned messy way. Fingers are now swiped on a computer pad, and recorded with more accuracy online where they can be compared to any fingerprints of offenders throughout the country or world. Yuri's boy is in trouble again!! 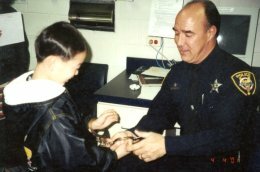 This time he is being handcuffed, but alas, he keeps slipping out of them!! 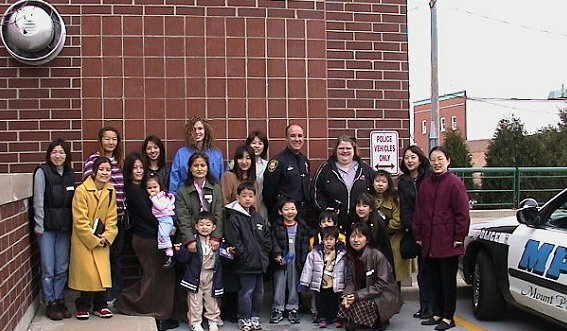 A group shot taken outside the police station with our tour guide Officer Bill Roscop. I'm handing Lt. Rich Doubek a camera - just getting ready for that group picture. 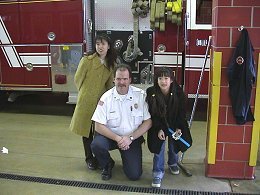 Yukiko and her daughter posing with Lt. Rich Doubek. 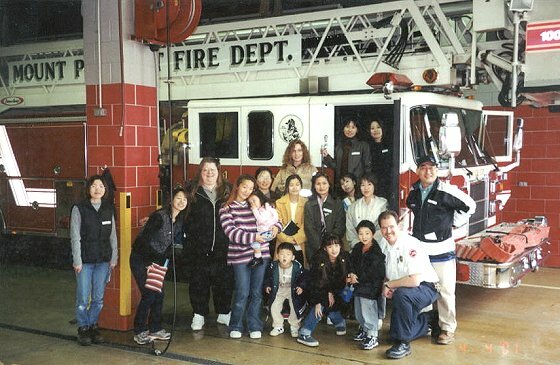 Here is our group picture, with a few friends joining us, including our tour guide, Lt. Richard Doubek. Not only was the tour a great learning experience for my class, it was also a great time. 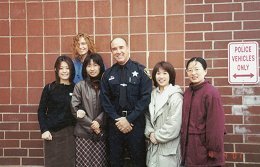 We would like to take this opportunity to thank Officer Bill Roscop of the Mt. 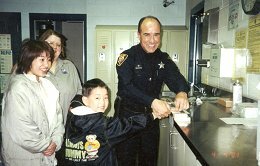 Prospect Police Department, and Lt. Richard Doubek of the Mt. Prospect Fire Department for taking the time to help us understand the valuable services you provide our communities. 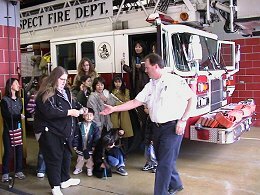 This has helped our students feel more comfortable in case there is ever an emergency that arises while they are here in the United States.